Scientist Chris de Freitas doesn't seem very scary. The associate professor from the University of Auckland, N.Z. 's, School of Geography and Environmental Science came to Calgary with a defensible proposal: that global warming theory should be debated on its scientific merits -- the facts. Any policy changes aimed at influencing the world's climate should be driven by our scientific knowledge, not "climate catastrophism." Yet, the mild-mannered de Freitas appears to have the global warming movement frightened to its bones. Even before his luncheon presentation Thursday before the Friends of Science, an event that drew about 200, this newspaper was receiving e-mails challenging the credibility of de Freitas' work at Climate Research, a scientific journal. He's also the subject of caricature at the New Internationalist, some U.K. neo-Marxists who appear to fulfil their religious needs through adherence to global warming dogma -- and Inquisition-like denunciation of doubters. De Freitas is routinely portrayed as out on the fringes, a tool of Big Oil, an isolated lunatic raging against an issue that's clearly settled. Most critics avoid engaging him on his two simple questions: Is the world's climate getting warmer and, if it is, is humankind responsible for all or part of this? Perhaps the basic facts are too damning. Human-related emissions of carbon dioxide are the global warming movement's bete noire. Yet as a greenhouse gas, C02 is a punter, vastly outweighed by (natural) water vapour. And human-related C02 emissions are a fraction of this fraction -- 0.12 per cent. Human-related C02 emissions soared after 1940. Yet most of the 20th century's worldwide temperature increase occurred beforehand. How can C02 be the cause? Alarmists exploit "General Circulation Models" to predict future climate catastrophe. Yet these computer programs can't replicate our known climate history. This is a tiny sample of the evidence de Freitas wields. "Reality is not conducive to alarmism," says de Freitas. "Given a choice between alarmism and honesty, science must always choose honesty." We've always thought that this is exactly the ground on which the battle over Kyoto - and any variant of "climate change" -- needs to be fought. But for years nearly everybody was willing to surrender the field of facts. So the believers were able to advance their claim that the science was settled. The only question remaining was what to do about it: ruin our economy, or merely disrupt it? Much of Canada's oil and natural gas industry played along. Officials in the Canadian Association of Petroleum Producers decided to accept the theory's validity (sincerely or otherwise), thereby buying themselves a seat at the policy table and, they hoped, influence over how Kyoto was to be applied. Intellectually lazy, this was a dangerous game. Governments routinely adopt mad schemes notwithstanding one's willingness to "work with" them. This was, after all, the government of the billion-dollar gun registry, $100-million Innu hamlets and other follies. Remaining skeptics, like Talisman's Jim Buckee and Imperial Oil's Tim Hearn, were portrayed as dinosaurs or unqualified to comment. "There's been so much politics, so much belief, so many feelings," says de Freitas. What's needed is "a thorough scientific analysis." Oddly, after all these years he sees a modest trend toward "a more sober approach." In early April, 60 scientists called upon Prime Minister Stephen Harper to launch a review of the science behind Canada's climate policies. So, now we're back where we were in the early '90s, debating the science. After the fall of the Soviet Union, Polish ex-dissidents commented that a crucial moment in their awakening was Pope John Paul II's visit to his motherland in 1979. For years, the dispirited dissidents had assumed they were virtually alone, and that most Poles backed the communist regime. But when millions turned out to see the Pope, these seemingly isolated individuals realized they were part of the majority. For Poland's tyrants, it was the beginning of the end. To those who doubt the scientific basis of global warming theory, we say: Don't let a cabal of government-funded scientists, environmental activists and journalists convince us they're the mainstream. George Koch is a Calgary freelance writer and John Weissenberger a Calgary geologist. More of their writing can be viewed at their weblog, drjandmrk.com. Well it's true enough. Stick to the facts, rather then vague predictions of what might be. Another AGW thread? Do the apologists for Big Oil and the coal mining industry never give up? Unless someone can actually present some evidence that the last three decades have not been the warmest in recorded history it may be time to give the topic a rest. If we stick to the facts, that would certainly limit climate debate. We could not discuss future climate change at all, since it hasn't happened yet. In fact, we could not discuss the future in any way. Certainly would make life more interesting, couldn't even do weather forecasts. Think of how we could apply this in other areas: what's on tv tonight? Don't know, it hasn't happened, so it's not a fact, so I can't say. I can tell you what was on last night, though. I think we've already chewed this topic to death and are still no clearer as to what the right answer is. There is definitely evidence of polar warming, but if anything I think some areas of the world have cooled off a little. Whatever trend we are in we have no way of knowing that it will continue. Another AGW thread? Do the apologists for Big Oil and the coal mining industry never give up? You ought to take a quick look-see to determine who is doing all of the posting in these threads in the last while. ... But, but... How can that be?.. Afterall, there is a concensus. The planet's climate is always in flux..........400 years ago there were fairs on the frozen surface of the Thames. If you can prove climate change, then you must prove that man is responsible.....then you need to come up with viable alternatives to oil.........ask Ontario how easy that is! Personally, I don't think we will be weaned off oil in any meaningful way for decades.......no matter what. And i don't think that is insane. What IS insane is re-building New Orleans in the same place. Adapt. It is what we are good at........adapt to a changed climate. Don't jump off the cliff................just adapt. Tell that to the Dutch. 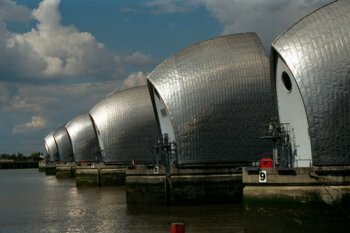 Thinking long term: While the 1965 team of engineers in New Orleans tried to build levees strong enough to withstand the strongest possible storm in 200 years, Dutch engineers designed a system strong enough to match the kind of catastrophic storm that only occurs once in 10,000 years. 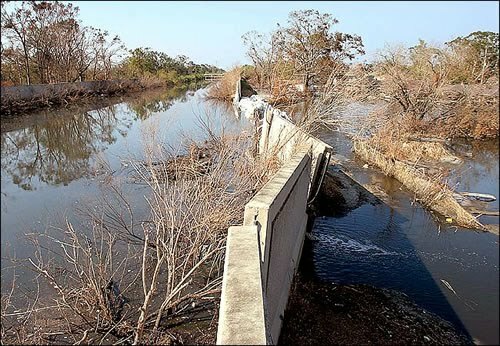 Less reliance on solid barriers: Instead of constructing increasingly bigger barriers like levees and floodwalls, Dutch engineers have sought to create better ways of absorbing floodwaters in marsh plains and specially constructed rivers. In some cases, this even involves setting dikes farther back from the water . New textiles: The Dutch also developed tough, synthetic textiles to better anchor earthen levees. These prevent soil movement and water penetration. The New Orleans levee system began using this technology following Hurricane Katrina. Better monitoring systems: In addition to commanding more stringent, centralized control and maintenance of their dikes, the Dutch also use automated surveillance systems to keep an eye on how their levees are holding up. They installed fiber-optic and electronic sensors in dike structures to report changes back to a central monitoring station. Several other systems monitor water pressure and water level. Much of the Dutch levee system relies on the understanding that levees require regular maintenance, constant monitoring and a long-term appreciation for how rivers, oceans and storms behave. When these are in place, communities can thrive safely alongside the beauty and convenience of coastal and riverside areas. It's when we fail to remember this that rivers and oceans become destroyers. I think the point Colpy is making, Avro, is that New Orleans hasn't been seen to be following a Dutch-style model for the most part. Much of what we see is the same old same old. Adapting could be simply changing how New Orleans or other parts of Louisiana build their flood controls, from their old style into one more closely ressembling the Dutch model. - waste is waste and is never a good thing. In the long run it always costs money, even when it is inconvenient or seemingly cost effective in the short term. Yes, we as a society SHOULD be looking for clean energy sources and more efficient ones. We should also be looking for cleaner and more efficient means of producing and utilizing existing sources. Its common sense. That shouldn't mean we need to invent world altering boogeymen to do what is smart. If that is what he was trying to say he would have said it. It's just about being part of a club for these crazy buggers. The world is ending, and I'm better than you because I'm part of the group trying to fix it by taking all of your money, hahahahahahaha, they'll spare me afterwards, right? nope, it's climate change now because the earth is nowhere near warming no matter what Bs they try to sell us. It's actually well below average temperatures across Canada this year and more recently. Bu tI'm sure some Island in the middle of nowhere that nobody has eve rheard of has been averaging 150 degree fehrenheit temperatures recently, that'll bring the numbers up, much like they were caught lying about temperature readings at bouys across the Atlantic which gave them their BS numbers to begin with, and also was the cause of Climategate. but yea, it's climate change now, don't get it twisted. Still recycling the same old fallacious (fellatious? ) arguments. aren't you in favour of recycling? Shouldn't we all live as slaves and give our money to al gore and the big international bankers to save our planet? Whether climate change is real or not, we are altering the chemical composition of our atmosphere to such an extent that it is becoming toxic. This has given rise to an epidemic of respiratory diseases world wide. I am beginning to see global warming as a smoke screen to avoid the inevitability of destroying our life support system to the point that we will extinct ourselves. It matters very little if the burning of fossil fuels is causing our atmosphere to warm up if you can't breath the air without causing your body irreparable damage. The debate is there to cause division and inaction. We need to ween ourselves off fossil fuels because it is killing the planet, not just warming it up a little. Lay off the shrooms. It's really not your kind of drug. Above normal for Atlantic Canada, Quebec, Northern Ontario, Northern Manitoba and Nunavut. Except for the Yukon the rest of Canada has been near normal. Yukon cold was caused by Arctic oscillation which also led to a higher than normal temp for the high north and Arctic region and cooler temps for the West coast and Europe. They should exspect more of the same as the Arctic warms and the colder air spills south. Hey, can I join the climate change crowd? I want to switch sides. If I join do I get the smarminess and sass of the average chicken little? cuz, that's what I'm really after, smarm and sass. that would complete my package. Why? This is only my second first post in such a thread in several months. However, I have noticed you avatar in quite a few. You should stick to the other side. Hot air and bloated diatribe are more your thing. Heh, that makes me want to grab some Fosters in Aussieland. Last edited by mentalfloss; Mar 11th, 2011 at 10:41 AM.. It's nice to see some people grasp the concept of displacement. I'm on the side saying the air ain't all that hot though. You're side is the hot air side,or at least it was, now it's the "hey, there's some weather going in various places places that is not exactly the same as it was the day before, see, that proves it," side. My stance only changed once - when I went from skeptic to proponent. I know, that's why you're stuck. You are too proud to change your opinion again so you stick with the stupid one you have. my stance has changed exactly zero times. i started thinking it was likely but wasn't sold on it, and then went to firmly not believing any of them, especially the lying criminals that give you your information. Deny Facts or Oppose Facts -- Any Difference ?